Great for wireless mice. Battery saving design. 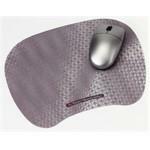 Patented micro-textured Precise surface helps your optical or trackball mice work better. Virtually eliminates slippage at faster mouse speeds. Point, click and drag quickly, smoothly and accurately. Ultra thin profile. Silver design.